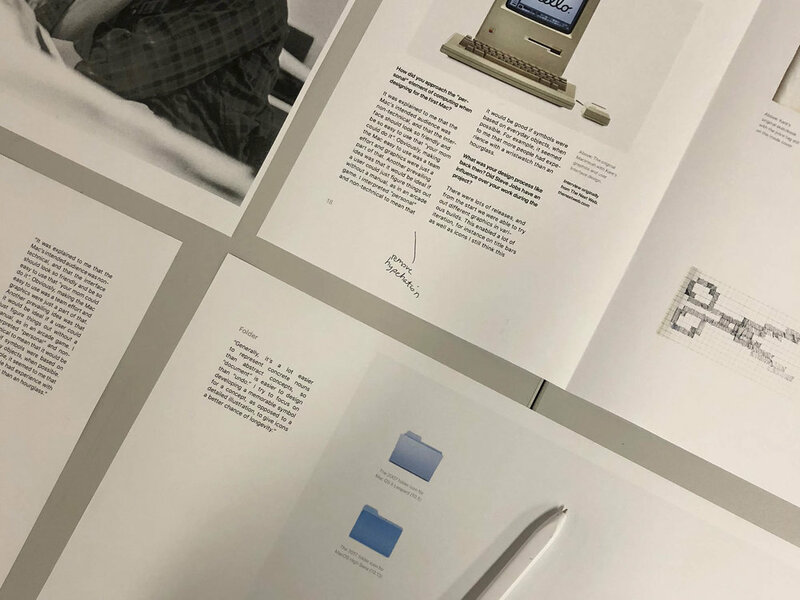 It was only in the last two weeks of this project that I decided to collate all of the stories, experiments and icons into a printed publication. This meant I was working to tight deadlines trying to get everything finished in time. I booked a slot with the printers at Chelsea, first thing in the morning so they could print and perfect bind my publication in time for the hand-in deadline two days later. As the design of the publication happened reasonably quickly, I didn't have much time to print test copies and proofs so the night before the print deadline I stayed at the Central St Martins library until the early hours of the morning making the most of their A3 print facilities, guillotines and large workbenches. The night before the deadline I printed several test copies of every spread, made many annotations and it made all of the adjustments save the file was ready to print at 9:30 the following morning, when the printers opened. This is the second publication that I have created that involved every stage of the process, from initial ideas to concepts, drafts, design, print and binding. I was able to utilise my knowledge from the second-year editorial project and build on those skills to ensure I ironed out any layout and formatting errors. I started by printing every spread full-size on a thrA3 pages, I then set about reading every spread from start to finish and annotating any issues I found. This meant circling orphans, paragraph edges that needed smoothing out and small grammatical errors in the copy such missing semicolons, capital letters and punctuation. To keep in line with the gridded and geometric style of Susan Kare's icons, I fully justified most of the text paragraphs to create a boxy and grid-like look to the spreads. In InDesign, I turned off hyphenation, so the text was easier to read, but this lead to some lines needing force returning to make the paragraphs flow better. The whole process of reading the publication end to end and checking for any grammatical errors took a couple of hours, by the end of which I had several dozen spreads covered in annotations, circles and notes that I then needed to rectify. After rectifying all of the issues from the first test proof, I then printed all of the spreads again for further inspection. This time I moved to an empty part of the library, as it was 2 AM large desks that are usually crowded were empty, so I made the most of them by spreading all of my pages across them so I can visually see the whole publication as a flat lay. I steadily worked my way across the table checking each spread in chronological order until I reached the end. There were far fewer errors as most of them had been spotted in the first proof however some critical issues were still present. 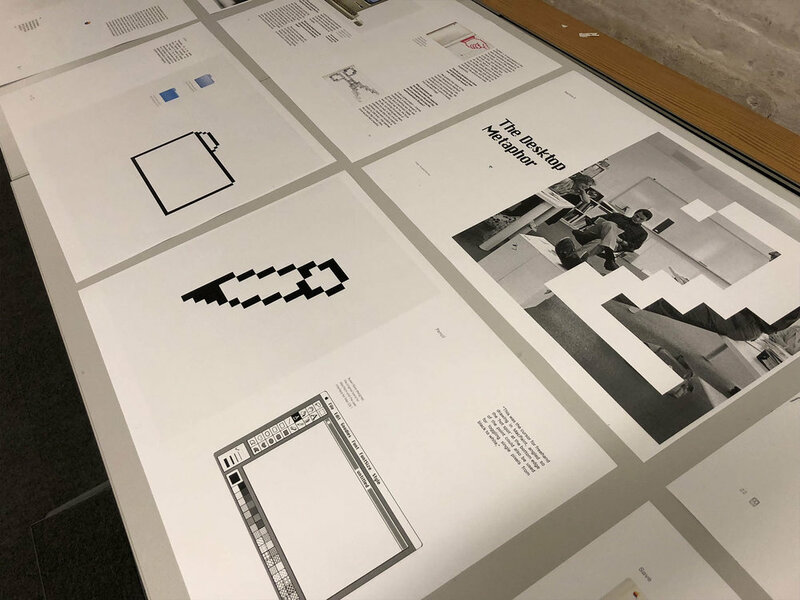 In this test proof, I felt like the font size was slightly too big so I re-printed a couple of the spreads with a point size lower to make a direct comparison and decide if I should reformat the whole publication in a new point size. I preferred the smaller font size but didn't want to waste the resources required to print every spread again, say I chose only to reprint the most text-heavy spreads to check they looked good in the smaller font size and trusted that the other pages would look good in the final publication. The tests proofs were extremely valuable as I was able to spot a lot of errors that I did not notice on screen. Seeing the spreads printed at the full size I was also able to make decisions on the point size of the primary body copy and inspect image resolutions with far more confidence. I am really glad I made this extra effort to do additional test prints as I could not spot any errors in my final printed publication.